If you have not yet registered at TNG (where we maintain the lineages), and received a confirmation, you are NOT in the list. go HERE to register at TNGand please, if you have tested DNA and are part of the Smiths DNA project, include your kit #. If you are new, please send your line that includes Smith/Schmidt/Smythe etc to info@smithsworldwide.org – You may use this form if you like. 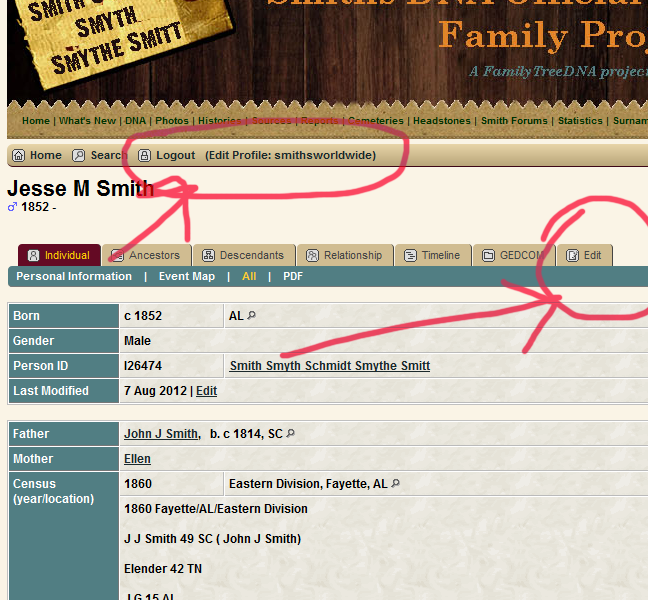 All registrations are pending approval and having both received and listed the direct Smith lineage; if you cannot login but you did register, have you sent in your tree? Have you received an email saying that your registration has been approved? If not, then the volunteer admins are still getting your tree listed. The registration on TNG (our tree system) is also NOT the FTDNA login. IF you don’t intend to actually post or edit any information, you don’t need ANY login and registration at all, as you can read the trees (except for information marked private or “living” without being logged on. If you DO wish to logon to TNG, here is how you can know if you are logged on or not. If you are logged on, you will see your name where the Login/Register currently is, along with a link to your tree on the site. If you have not yet registered at TNG (where we maintain the lineages), and received a confirmation, you are NOT in the list. go HERE to register at TNGand please, if you have tested DNA and are part of the Smiths DNA project, include your kit #. 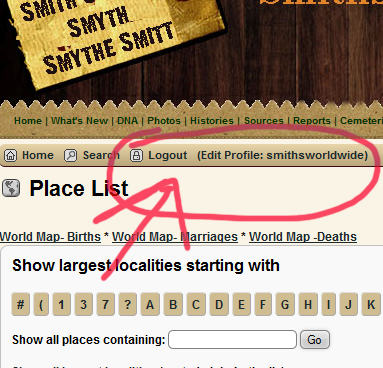 If you are new, please send your line that includes Smith/Schmidt/Smythe etc to info@smithsworldwide.org – You may use this form if you like. The registration on TNG (our tree system) is also NOT the FTDNA login.